My daughter was born with a rare metabolic condition. She received a liver transplant when she was a toddler, and until recently had as smooth a ride as you can have as a transplant recipient. She recently fought acute liver rejection, she spent her last school holiday in the hospital and was off school in isolation at home for two weeks afterward. It was terrifying and heartbreaking, but rejection is part of life after transplant. The underlying worry of it is ever-present, and for some people that fear sadly becomes a reality. My amazing girl was beating it because she’s incredible and very, very lucky. We haven’t spoken much about it, but I’m doing so now for one reason — to ask everyone we know to think twice (and to ask their friends to think twice) before even considering being the person who risks making life worse than it has to be for children and adults who have compromised immune systems; they face more than their fair share as it is. Because one person chose not to keep their child with active chickenpox (blistered, unhealed spots) at home, my child has missed the last week of her reception year at school, and sadly, she’s not the only one. I’m as devastated as she is about her missing out on the final week of the school year (which included parties, a school trip, parents open afternoon and special assemblies), but I’ve got much bigger worries that she’s (thankfully) young enough to be unaware of just yet. 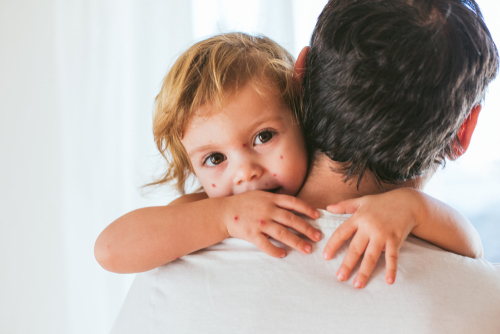 Aside from missing out on all the fun that she deserved to enjoy, my post-transplant child faces complications of chickenpox that most parents won’t even know about, let alone worry about. We brought our little girl home yesterday after spending five days isolated in the hospital where she was given IV drugs to help her suppressed immune system fight the chickenpox virus. Having cannulas inserted (and removed after failing, then reinserted) for any child is horrid. For a child like ours who battles with procedural anxiety, it is a sheer hell no child should have to face. She hasn’t slept for more than a couple of hours in a row since Friday (and neither have I), due to two hourly monitoring of her temperature, oxygen saturation and heart rate. And if that wasn’t enough for a 5-year-old to go through, we don’t know yet whether she has escaped serious complications such as organ damage or rejection (again). She was vaccinated before she was placed on the transplant waiting list (and believe me, giving the chickenpox vaccine to a child with a severe metabolic condition was a terrifying risk), but vaccines do not always work. And unfortunately, that was the case for our daughter who developed no immunity to the virus after her vaccine. In case it isn’t already obvious, I’ll spell it out clearly — the varicella-zoster (chickenpox) virus could cost my daughter her life. At best, it will have a bigger impact on her life than most people could even imagine.